The Beijing No 1 Intermediate People's Court on March 16 confirmed the validity of Yonghe King - a famous mainland Chinese fast food brand - by rejecting an appeal from former Taiwan soya-milk entrepreneur Lin Lizhen. 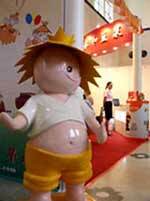 Yonghe is a city in Taiwan that is well-known for its soybean milk shops. 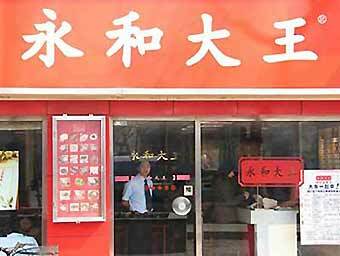 Yonghe King, registered by a Shanghai-based company in 1997, specializes in traditional Chinese food, especially soya milk. The judgment on March 16 supports a decision made last year by the trademark appraisal committee under the State Administration for Industry and Commerce, which rejected a request to withdraw the Yonghe King trademark by Lin and other eight Taiwan entrepreneurs. Lin claimed Yonghe is the name of some geographical areas in Taiwan and North China's Shanxi Province. "The Trademark Law prescribes that any place name above county level and foreign places cannot be used as a trademark," Wu Lixian, the agent representing Lin, said yesterday. The plaintiff also said Yonghe symbolizes the place of origin of high-quality soya milk. "Soybean milk in Yonghe is the most famous in China although soybean milk is a type of traditional food throughout the country," he said. "Yonghe King intended maliciously to monopolize the name of Yonghe on the Chinese mainland although it has never opened business in Taiwan," he said. In its decision, the court said that although Yonghe is a place name both in Taiwan and Shanxi, the trademark of Yonghe King consists of characters and pictures different from the ones used in the place name. "And (the word) Yonghe is meaningful in Chinese - it means always peaceful." Sources with the court said place names that also have other meanings can be used and are effective, according to the Trademark Law. "As a result, place names are not absolute barriers to trademark registration and the trademark of Yonghe King does not violate the law," the court decision said. It was confirmed by the court yesterday that although Yonghe is often used as a name for soya milk shops in Taiwan, it has not become a geographic symbol identified with soybean milk. "So the trademark appraisement committee was right to make the decision in 2003 to maintain the trademark," the judgment said. "Soya milk has a history of several hundred years in China. No place name can be a geographic symbol for it," Lu Yulin, an agent for Yonghe King, said yesterday. "Before Yonghe King opened its business on the mainland, soya milk from Yonghe was not as widely-known as it is now." "Fast development of Yonghe King is only due to our successful operations, not just the name Yonghe," she said. Lin, currently a Hong Kong permanent resident, invested in a fast food shop jointly with Yonghe King, without any written contract, in early 1997 in Shenzhen. The co-operation stopped late in the year but Lin continued to use the trademark.